Machine operators, construction workers, factory personnel, and other people who work with heavy equipment face dangerous work conditions every day. Sometimes equipment is defective or not properly maintained. Other times, workers don't have the training or supervision to operate machinery safely. If you were injured in an industrial accident involving heavy equipment, you may be dealing with serious health problems. These types of accidents can result in spinal cord injuries, paralysis, or even death. Hiring a lawyer is probably the last thing on your mind, but if you want to get all the compensation you deserve, you need a legal team on your side to look out for your best interests. Our law firm has over 35 years of experience helping injury victims. Starting with your free legal consultation, we work with you to answer your legal questions and help you figure out your next steps. Best of all, if we don't negotiate a settlement or win a verdict in your favor, you owe us nothing. Because industrial accidents are so time sensitive, it's important that you call our legal professionals today. We're available 27 hours a day, 7 days a week, and you can reach us by phone at 1-866-943-3427 or submit your information in the form at the top right of this webpage. 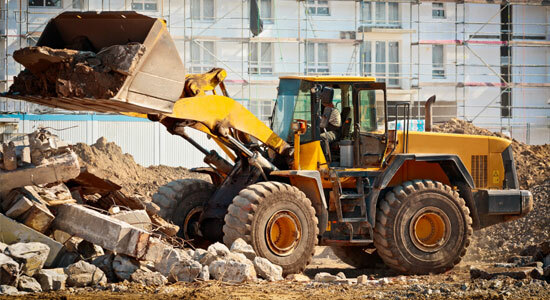 Heavy machinery is commonly found on construction sites and in mines and factories. These workplaces are already dangerous, and heavy machinery only makes the risks worse. In the construction industry, for example, heavy vehicles and equipment are involved in more than 50 percent of all worker fatalities. Overall, heavy machinery is a threat to worker safety and can cause devastating injuries or even death. Because some types of machinery are so large, it can be difficult for drivers of heavy equipment to see when they're backing up, even with side and rearview mirrors. If the vehicle lacks a reverse signal alarm, this is especially dangerous because other workers may not hear the machine coming toward them. Vehicles backing up are involved in many worksite fatalities. This is one of the most common causes of worker fatalities on construction sites. In 75 percent of cases in which a worker is struck by an object, heavy equipment is involved. These types of accidents often involve trucks, cranes, or other types of heavy machinery. Also common is workers being crushed by, or pinned between, heavy machinery. Sometimes accidents involving heavy equipment occur because the equipment is defective. In this case, you may have a third-party claim – a claim involving a party that is not your employer. This could be against the manufacturer of the equipment that caused your injury. If you sustained an injury from heavy equipment, you're probably trying to figure out what to do next. You might be wondering if you even need a lawyer. Having our team of experts on your side can mean the difference between getting fair compensation for your injury and settling for less than you deserve. You have nothing to lose by submitting your information at the top of this webpage for a free and confidential legal consultation. Although working with heavy machinery always comes with a risk, following safety protocol can protect you from dangerous and potentially fatal injuries. Never exceed the weight capacity of cranes, hoists, and scaffolds. Be alert when working around heavy equipment, even if it's not in operation. Make sure you're always visible to heavy equipment operators on the worksite. Follow-up with required inspections of all equipment. Wear a seatbelt unless you're operating stand-up equipment. When you're driving a vehicle in reverse gear, make sure the reverse alarm is in working condition and is audible above surrounding noise.